This past weekend I crossed the finish line on my 2014 running goal: 750 miles in a single year. For me, that is a whole lotta miles! When I set it I wasn’t really sure if I could do it. This goal represented running 250 miles more than I had ever run before in a single year. So how did I do it? I broke my goal down into manageable chunks and spread it out over the entire year. To hit my goal I needed to run 15 miles a week for 50 weeks. This gave me two weeks off (in case of injury or illness) or a bit of wiggle room just in case I got behind or needed some extra rest days after a big race. But all in all, the plan was simple and solid—15 miles a week each and every week. With New Years right around the corner, I hope you’re thinking ahead to 2015 and some positive changes you’d like to create in your life. Whether you like to call them goals, resolutions, or “good things” (as a friend of mine calls them), setting the intention to be, do, or experience something better in your life is an incredibly empowering thing. Even if it seems really difficult, and you have doubts about whether or not you can do it, go for it! If I can run 750 miles, you can achieve your goals, too! Here’s how to do it, keeping in mind these ideas can be used for any goal such as organizing your entire home to running 750 miles. 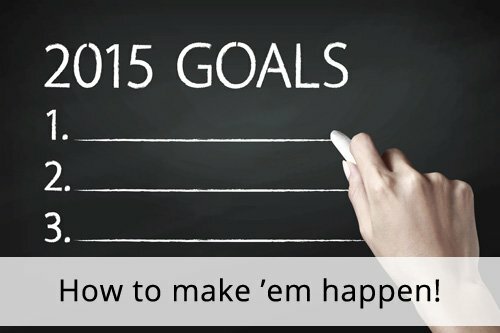 Step 1: Set a goal and make it measurable. Measurable goals are trackable. You can count the number of miles you run, the number of minutes spent organizing, the number of bags donated, or the number of rooms completed. Step 2: Spread it out and divide it up. Just as I spread out my running goal over the course of entire year, look for ways to spread out your goal, too. Give yourself plenty of time to achieve it, and then divide the goal into small, manageable chunks. For example, count up the rooms in your home and then break the larger rooms into smaller zones. Each zone will become a smaller organizing project that you tackle one at a time. For example, your bedroom could be divided up into dressers, nightstands, and the closet, and your kitchen could be divided up into pantry, refrigerator, freezer, drawers and cupboards. Once you have your list, figure out how many zones you need to do per week to finish by the end of the year. Depending on the size of your home, you could do one zone every two weeks, or you might need to do 2 zones per week. The trick is to know what your bite-sized goal is each week, so you know exactly what you need to do to keep on track. If the first two steps of this process were difficult, or left you feeling like you still aren’t sure what steps you need to take to move forward on your goal, get support. Sign up for an online class or ask a friend who has experience in what you want to do. I ran many of my 750 miles with the my running buddies and I know for sure I couldn’t have done it without them. (And I probably wouldn’t have wanted to either!) So get the support you need to make your goal more manageable and more fun. Step 4: Track and celebrate. I tracked my miles in a running app, so it was easy to see how I was progressing on my goal. Do the same with your goal. You could draw a floor plan of your home and highlight the storage areas and ultimately entire rooms as you finish organizing them. Or you could use a simple list that you hang on the refrigerator. Pat yourself on the back every time you complete a project and cross it off your list! Step 5: Get started today! The great thing about bite sizing your goals is that it’s easy to get started right away. Just pick a project, and go make some progress. Here’s to you and your goals in 2015! Do you set goals? If so, I’d love to hear about them in the comments below. Great post! And congratulations for your goal!!! I had a similar running goal this year: 1000km! And I did it!!! Yeah! I divided the km for months but in weeks is even better! I’ll try to upgrade to 1200km (750mi) in 2015! Congratulations to you! What a terrific accomplishment. Happy 2015 to you! The spread it out and divide it up is still a hard concept for me. When I get started I want to get it all done. I know in practice I will do little bits at a time but sometimes the big picture keeps me from getting started. Or at least wait until I have a full week or so to work on things. Thanks for sharing your thoughts Petra. I big part of it probably depends on the goal. Certainly running 750 miles all at once wouldn’t work, but for some goals hunkering down and getting ‘er done could be a terrific approach. Like everything else, the trick is to find what works for you – and then keep doing what works. Step 5 is the one that may help me the most. I have tired myself out making master and daily goal lists in the past to the point that I was not actually accomplishing anything physically that day. This year my mantra will be “Do something – Do it today”. Thank you for the inspiration. Great mantra! Thanks for sharing it!